After the Norman conquest in 1169 the Anglo-Norman De Barry family settled in East Cork on land granted to them by the King of England. Over the next few centuries the family became very wealthy and influential in the area. A branch of the family, the Barrymores, built this medieval tower house in the middle of the 16th century on reclaimed slob land. I believe the inside of the castle has been beautifully restored with period fittings and furnishings. Sadly the castle suffered from flood damage during the winter months and at present is not open to the public for safety reasons. I was lucky however to meet a super guide named Robin who brought me around the exterior of the castle, pointing out some of the tower's wonderful and original features. The tower house consists of a large rectangular block with projecting towers at the NE and SW corners plus a third tower extending east from the south end of the east wall. The tower was entered through a pointed-arch door in the north wall. 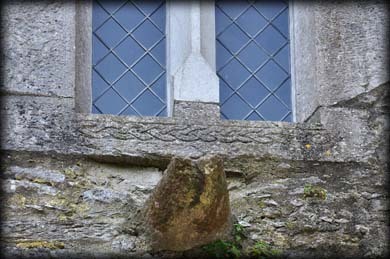 The carving pictured left is original and can be seen below one of the windows in the north wall. The tower house has Irish style crenellations. I think only one of these is original. 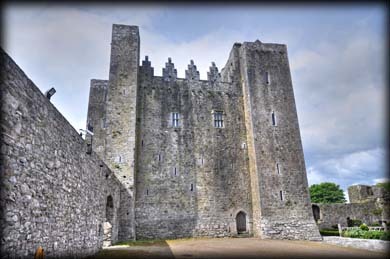 The castle is located in the south east corner of a rectangular bawn. 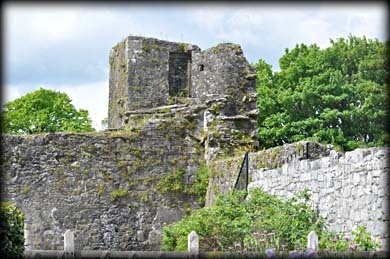 There were three towers at the NE, SE and NW corners of the bawn wall. Pictured above are some of the various types of windows located in the tower. There is also a vast array of gun loops located around the tower. 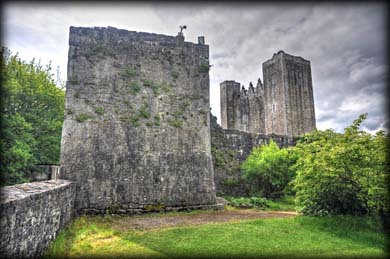 The De Barrys supported the Desmond rebellions and in 1581 they intentionally destroyed or damaged some of their own castles to prevent the English occupying them. After the second rebellion the De Barrys were pardoned and soon returned to Barryscourt. 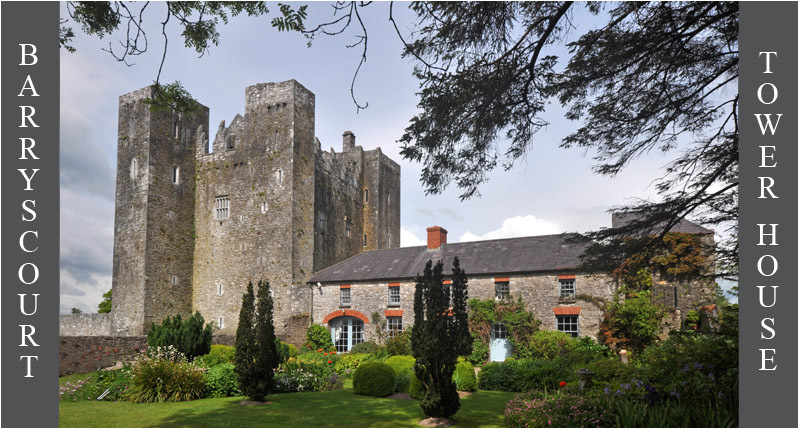 By 1617 the family had stopped using Barryscourt as their main residence and moved to Castlelyons. At the end of the the 20th century the castle had fallen into a sad state of repair. 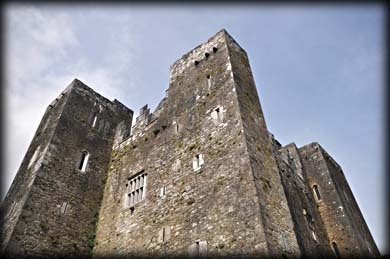 The Barryscourt Trust was set up in 1987 with the purpose of conserving the castle. It is now run by the O.P.W. Situated: Easy. From Cork City head east on the N8 it changes to the N25. Take exit 4 and follow the signs for Barryscourt Castle. Discovery Map 81: W 8217 7250. Last visit May 2014.